Have you ever googled "Chili Recipes"? There are over a million of them floating around on the internet! And now I'm going to add one more to the mix. Why not right? This whole thing started because my husband came home the other day saying he had this fantastic fund raising idea for our sons basketball team - "Let's do chili dogs at the next game!" I agree this is a good idea (although more appropriate for Baseball?) so I listen. 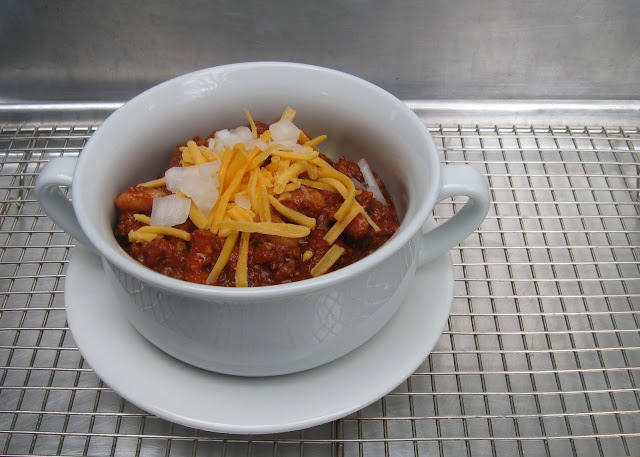 Then about half way through the "idea" I realize I am in charge of the chili portion of chili dogs (???) - to be sold by the bowl and thus raising money for the team. Husband is not sure why it took so long for me to come to this realization. Tore the kitchen apart looking for an old recipe from my mother. No luck. Therefore put this together from memory - and it turned out pretty tasty. 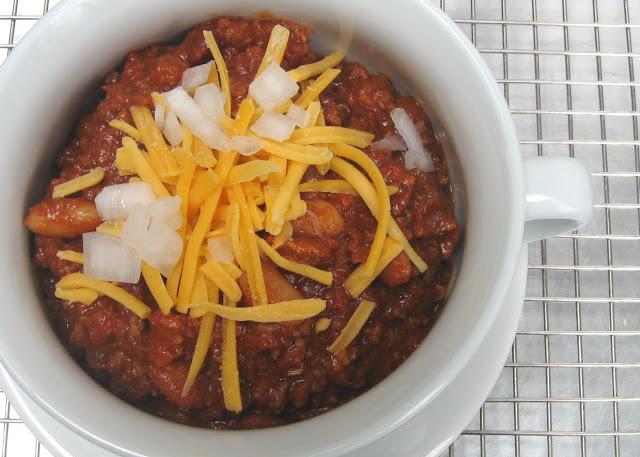 Nothing fancy about this chili. Just delicious and definitely filling. Keep in mind this recipe was to feed the parents of an entire basketball team. I imagine there would need to be some adjustments made for most families. Crisp the bacon in a very large pot. Remove and drain most of the bacon grease. Brown the ground beef in the same pot that still has a little of the bacon grease in it. Then drain and set aside for a minute. In the same pot - saute the onions in a tablespoon of olive oil until softened. Add garlic. Cook about three minutes then add beef and bacon back to pot. Give everything a good stir - add the tomato paste and give everything another good stir to coat. Add all the cans of tomatoes. Stir really well then add all the beans. Finally, add the chili powder, cumin, garlic powder, brown sugar and salt/pepper. Taste and check for seasoning. I could not make this too spicy for this event - you might want to add more of the chili powder and cumin. Serve with grated cheese and chopped onions for garnish. Enjoy.